OUR OTHER CURRENTLY FEATURED BOOKS, “LONGING FOR HOME,” BY LISA WAYMAN AND “A MASTER’S PATH,” BY PENELOPE JEWELL, CAN BE FOUND BY SCROLLING DOWN BELOW THIS POST. SUMMARY: Phoenix and Justin Sunder are master cat burglars and best friends until Dylan Panicosky enters their circle of hedonism and crime. 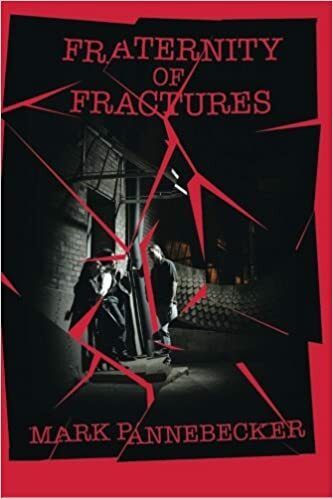 Set in the blighted city of St. Louis in the ’80s, Fraternity of Fractures is a love triangle played out in an urban setting full of nocturnal decadence and danger, with all the players fractured in their own way. THE BACK STORY: This was my first novel. It was originally written as a screenplay titled Nightwalkers. I started this story as modern day Cyrano de Bergerac (with a twist) but it quickly took on a life of its own. WHY THIS TITLE? : The title Nightwalkers, although by definition was correct, had the wrong implication, and I started thinking along the lines of Confederacy of Dunces..
WHY WOULD SOMEONE WANT TO READ IT? I think this is a good piece that shows the honor-among-thieves ideology and the internal cognitive dissonance and external conflict that such a life presents. “To call Fraternity of Fractures a ‘crime novel’ or a ‘novel of suspense’ would be to do it an injustice. Embracing elements of different genres (mystery, suspense, crime) and yet rising above them all with a sense of purpose and atmosphere that satisfyingly wings its way above and beyond most genre reads, it’s an involving and evolved piece that ultimately connects the changing courses of very different lives…. Not for the mild-mannered reader in search of light entertainment, Fraternity of Fractures not only invites its readers to think – it demands it. The smoky backdrop of 1980s St. Louis in the midst of a crime wave is only one facet of a story about fractures, healing, and change: an exquisite standout in a world of fast and dirty crime scene whodunits that sketch their worlds without truly capturing their complexity.” D. Donovan, Senior Reviewer, Midwest Book Review. AUTHOR PROFILE: Mark Pannebecker started falling asleep just over ten years ago when he lost his desire to write. Thinking it was just a nap, a writer’s block, he closed his eyes. But attempts to awaken and force himself out of his writer’s block failed. Months rolled into years where Mark wrote nothing yet still called himself a writer. The years languished over him as he slowly lost his dharma. And so he slept, without a life purpose, following the dreams of others. Until an insignificant event occurred that awoke him. He lost a job that held great promise (one of many). After all the yoga and kirtans and meditation and breath-work and chi gong and getting in touch with his feminine and chanting and searching the metaphysical for answers and the soul searching and the soul expansion and the embrace of the Goddesses, the Buddha, the Hindu gods, it was this seemingly insignificant event that lifted the veil. And just like that, Mark’s muse returned carrying his dharma. Mark had never tried to get published in the past for he loved the process of creating and was happy riding his motorcycle, traveling, living, loving, and writing. But it is time now to put the body of his work out there and pick up where he left off. He is proud of his past work that he offers now and hopes you enjoy it. Mark is in the process of preparing and writing new work, alive and fresh from a long slumber. Mark Pannebecker is an author of fiction. He started out as a filmmaker but soon fell in love with the creative writing process and began to shift his focus from producing and directing films to writing screenplays. He wrote in whichever genre held the narrative best. He’s written screenplays, stage plays, novels, novellas, and has recently published a collection of poetry titled Motorcycle Boy Lives and a collection of short stories titled Godsfood. His first novel, Fraternity of Fractures, was originally written as a screenplay and was published in 2015. His second novel, Myth of Love, will be published in the latter part of 2016. AUTHOR COMMENTS: I hope to establish myself as an atmospheric writer who creates 3-Dimensional characters.